SERENE COUNTRY SETTING ON 16 ACRES, QUIET COUNTRY LODGE WITH HOTEL AMENITIES, WOOD FIRED HOT TUB, IN ROOM MINI BARS, CATERING AVAILABLE UPON REQUEST, AND SUMMER HOLIDAY CLAM BAKES. 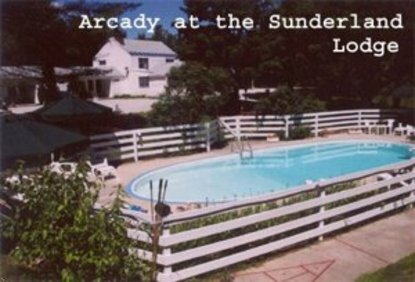 ARCADY AT THE SUNDERLAND MOTOR LODGE IS A PASTORAL SCENE SET IN 16 ACRES OF ROLLING LAWNS AND FORESTS OF MAPLE, BIRCH, PINE AND OAK. THE SPLENDOR OF THE VERMONT COUNTRYSIDE IS JUST OUTSIDE YOUR DOOR AS YOU SIT ON YOUR SUN PORCH, STROLL ON THE LAWNS, TAKE A DIP IN THE POOL OR RELAX AFTER A BUSY DAY IN OUR OLD FASHIONED CEDAR HOT TUB HEATED BY A WOOD BURNING STOVE. IN THIS SETTING, ARCADY OFFERS A MEMORABLE EXPERIENCE TO TRAVELERS, VACATIONERS, FAMILIES WITH CHILDREN, FOLKS JUST LOOKING FOR A WEEKEND GETAWAY, AND ANYONE ELSE WHO LOVES PEACE, BEAUTIFUL SURROUNDINGS AND PRIVACY WITH MODERN CONVENIENCE.